Sea level rise hot spots -- bursts of accelerated sea rise that last three to five years -- happen along the U.S. East Coast thanks to a one-two punch from naturally occurring climate variations, a new University of Florida study shows. Jason Howard (FIU) and colleagues are zeroing in on the seagrass meadows that could help slow down climate change. 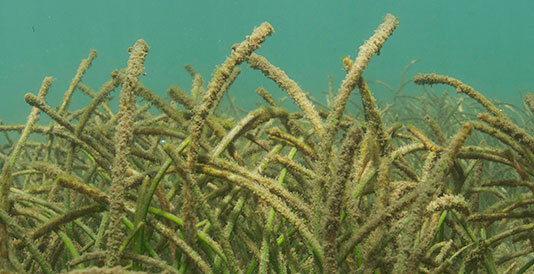 Seagrass meadows are great absorbers of carbon dioxide from the air. But the algae, animals, corals and plants that live among them release large amounts of carbon dioxide, according to newly released research. The scientists are now identifying seagrass locations with fewer emitters to target for conservation. 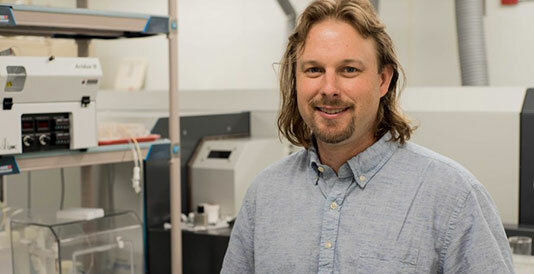 A 94-million-year-old climate change event that severely imperiled marine organisms may provide some unnerving insights into long-term trends in our modern oceans, according to Jeremy Owens (FSU). Odemari Mbuya (FAMU) and colleagues are working with partners in India to develop adaptation and mitigation practices for sustaible agriculture. More details about the project are available on the FAMU Farmer-to-Farmer Program Facebook page. Thomas Ruppert (UF) has updated information on the National Flood Insurance Program (NFIP) on the Florida Sea Grant Coastal Planning website. The update discusses the upcoming lapse of the NFIP on September 30, 2017, and provides a link to some of the most pertinent related legislation pending in Congress. 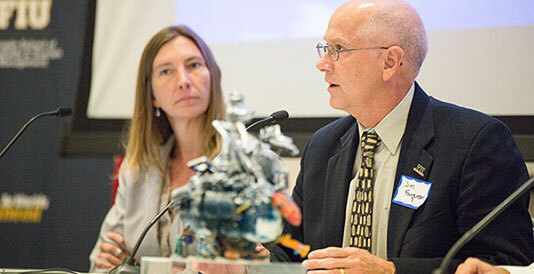 FIU marine ecologist James Fourqurean has been elected president of the Coastal and Estuarine Research Federation. Fourqurean will lead the organization, which is comprised of people who study and manage estuaries, with a plan to educate public officials about coastal science and resilience in a changing climate. Predicting the weather three to four weeks in advance is extremely challenging, yet many critical decisions affecting communities and economies must be made using this lead time. However, model forecasts available for the first time could help NOAA's operational Climate Prediction Center (CPC) significantly improve its week 3-4 temperature and precipitation outlooks for the U.S. The Subseasonal Experiment (SubX) is a two year project led by Ben Kirtman (UM) that combines multiple global models from NOAA, NASA, Environment Canada, the Navy, and National Center for Atmospheric Research to produce once-a-week real-time experimental forecasts as well as a set of forecasts for past dates, called reforecasts, now available to both CPC and the research community. The Florida Bar Tax Section (the "Section") has identified rising sea levels as a pressing issue for the future of Florida state and local tax law. 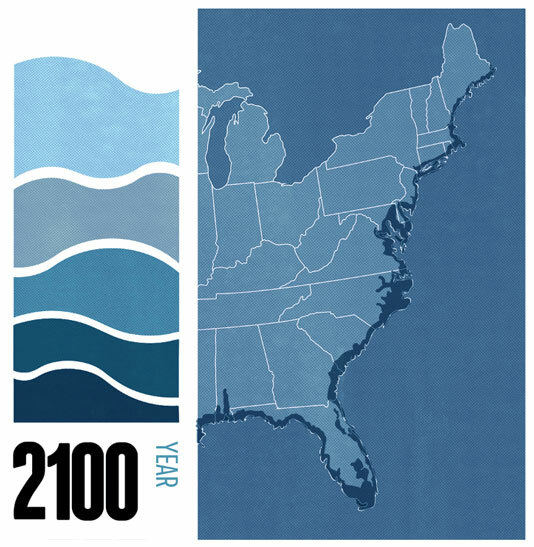 Hoping to start a conversation through research and writing, the Section invites submissions addressing "the potential impact of sea level rise on Florida's system of taxation." Submissions may include proposed statutory and Constitutional law changes, if any. Deadline: May 31, 2018. Xiaoming Wang (FSU) has been awarded a grant from NSF for his project titled "Some Mathematical Problems Associated with Hyporheic Flow." Barton, M. B., Moran, J. R., Vollenweider, J. J., Heintz, R. A., & Boswell, K. M. (2017). Latitudinal dependence of body condition, growth rate, and stable isotopes of juvenile capelin (Mallotus villosus) in the Bering and Chukchi Seas. Polar Biol, 40(7), 1451-1463. Benedict, J. J., Medeiros, B., Clement, A. C., & Pendergrass, A. G. (2017). Sensitivities of the hydrologic cycle to model physics, grid resolution, and ocean type in the aquaplanet Community Atmosphere Model. J. Adv. Model. Earth Syst., 9(2), 1307-1324. Breithaupt, J. L., Smoak, J. M., Rivera-Monroy, V. H., Castañeda-Moya, E., Moyer, R. P., Simard, M., et al. (2017). Partitioning the relative contributions of organic matter and mineral sediment to accretion rates in carbonate platform mangrove soils. Marine Geology, 390, 170-180. Canuel, E. A., Brush, G. S., Cronin, T. M., Lockwood, R., & Zimmerman, A. R. (2017). Paleoecology Studies in Chesapeake Bay: A Model System for Understanding Interactions Between Climate, Anthropogenic Activities and the Environment. In Skilbeck C. Gell P. S. K. Weckström K. (Ed. ), Applications of Paleoenvironmental Techniques in Estuarine Studies. Developments in Paleoenvironmental Research (Vol. 20). Springer. Celis, G., Mauritz, M., Bracho, R., Salmon, V. G., Webb, E. E., Hutchings, J., ... Crummer, K. G., & Schuur, E. A. G. (2017). Tundra is a consistent source of CO2 at a site with progressive permafrost thaw during 6 years of chamber and eddy covariance measurements. J. Geophys. Res. Biogeosci., 122(6), 1471-1485. Cerveny, R. S., Bessemoulin, P., Burt, C. C., ... Kalkstein, L., et al. (2017). WMO Assessment of Weather and Climate Mortality Extremes: Lightning, Tropical Cyclones, Tornadoes, and Hail. Wea. Climate Soc., 9(3), 487-497. Chen, R., Ebrahimi, H., & Jones, W. L. (2017). Creating a Multidecadal Ocean Microwave Brightness Dataset: Three-Way Intersatellite Radiometric Calibration Among GMI, TMI, and WindSat. IEEE J. Sel. Top. Appl. Earth Observations Remote Sensing, 10(6), 2623-2630. Chen, W., Han, D., & Wang, X. (2017). Uniquely solvable and energy stable decoupled numerical schemes for the Cahn-Hilliard-Stokes-Darcy system for two-phase flows in karstic geometry. Numer. Math., 137(1), 229-255. Chung, E. - S., & Soden, B. J. (2017). Hemispheric climate shifts driven by anthropogenic aerosol-cloud interactions. Nature Geosci, 10(8), 566-571. Darwish, K., Smith, S. E., Torab, M., Monsef, H., & Hussein, O. (2017). Geomorphological Changes along the Nile Delta Coastline between 1945 and 2015 Detected Using Satellite Remote Sensing and GIS. Journal of Coastal Research, 33(4), 786-794. Deng, J., McCalley, C. K., Frolking, S., Chanton, J., Crill, P., Varner, R., et al. (2017). Adding stable carbon isotopes improves model representation of the role of microbial communities in peatland methane cycling. J. Adv. Model. Earth Syst., 9(2), 1412-1430. Ebrahimi, H., Chen, R., & Jones, W. L. (2017). Calibration of Millimeter Wave Sounder Radiometers on Polar Orbiting Satellites. IEEE J. Sel. Top. Appl. Earth Observations Remote Sensing, 10(6), 2849-2854. Flower, H., Rains, M., Lewis, D., & Zhang, J. - Z. (2017). Rapid and Intense Phosphate Desorption Kinetics When Saltwater Intrudes into Carbonate Rock. Estuaries and Coasts, 40(5), 1301-1313. Freschet, G. T., Valverde-Barrantes, O. J., Tucker, C. M., Craine, J. M., McCormack, M. L., Violle, C., et al. (2017). Climate, soil and plant functional types as drivers of global fine-root trait variation. J Ecol, 105(5), 1182-1196. Gerlach, M. J., Engelhart, S. E., Kemp, A. C., Moyer, R. P., Smoak, J. M., Bernhardt, C. E., et al. (2017). Reconstructing Common Era relative sea-level change on the Gulf Coast of Florida. Marine Geology, 390, 254-269. Giam, X., Chen, W., Schriever, T. A., Van Driesche, R., Muneepeerakul, R., Lytle, D. A., et al. (2017). Hydrology drives seasonal variation in dryland stream macroinvertebrate communities. Aquat Sci, 79(3), 705-717. Haigh, I. D., Ozsoy, O., Wadey, M. P., Nicholls, R. J., Gallop, S. L., Wahl, T., et al. (2017). An improved database of coastal flooding in the United Kingdom from 1915 to 2016. Sci. Data, 4, 170100. Henderson, J. A., & Zarger, R. K. (2017). Toward political ecologies of environmental education. The Journal of Environmental Education, 48(4), 285-289. Hollowell, E., & Ruppert, T. (2017). Seawalls & Sea-Level-Rise-Induced Flooding: Addressing Public and Private Infrastructure. The Reporter of the Environmental and Land Use Law Section of the Florida Bar, 4. Howard, J. L., Creed, J. C., Aguiar, M. V. P., & Fourqurean, J. W. (2017). CO2 released by carbonate sediment production in some coastal areas may offset the benefits of seagrass "Blue Carbon" storage. Limnology and Oceanography, . Kelly, P., Mapes, B., Hu, I. - K., Song, S., & Kuang, Z. (2017). Tangent linear superparameterization of convection in a 10 layer global atmosphere with calibrated climatology. J. Adv. Model. Earth Syst., 9(2), 932-948. Khan, A. L., Wagner, S., Jaffe, R., Xian, P., Williams, M., Armstrong, R., et al. (2017). Dissolved black carbon in the global cryosphere: Concentrations and chemical signatures. Geophys. Res. Lett., 44(12), 6226-6234. Koi, S., & Daniels, J. (2017). Life History Variations and Seasonal Polyphenism in Eumaeus atala (Lepidoptera: Lycaenidae). Florida Entomologist, 100(2), 219-229. Li, F., Lozier, M. S., & Johns, W. E. (2017). Calculating the Meridional Volume, Heat, and Freshwater Transports from an Observing System in the Subpolar North Atlantic: Observing System Simulation Experiment. J. Atmos. Oceanic Technol., 34(7), 1483-1500. Li, J. - L. F., Richardson, M., Hong, Y., Lee, W. - L., Wang, Y. - H., Yu, J. - Y., et al. (2017). Improved simulation of Antarctic sea ice due to the radiative effects of falling snow. Environ. Res. Lett., 12(8), 084010. Martin, S. A., Rautsaw, R. M., Bolt, R., Parkinson, C. L., & Seigel, R. A. (2017). Adapting coastal management to climate change: Mitigating our shrinking shorelines. Jour. Wild. Mgmt., 81(6), 982-989. Mauritz, M., Bracho, R., Celis, G., ... Webb, E. E., et al. (2017). Nonlinear CO2 flux response to 7 years of experimentally induced permafrost thaw. Glob Change Biol, 23(9), 3646-3666. Meyers, S. D., Moss, A. J., & Luther, M. E. (2017). Changes in Residence Time due to Large-Scale Infrastructure in a Coastal Plain Estuary. Journal of Coastal Research, 33(4), 815-828. Morris, T., Hermes, J., Beal, L., du Plessis, M., Rae, C. D., Gulekana, M., et al. (2017). The importance of monitoring the Greater Agulhas Current and its inter-ocean exchanges using large mooring arrays. South African Journal of Science, 113(7-8). Mueller, N. J., & Meindl, C. F. (2017). Vulnerability of Caribbean Island Cemeteries to Sea Level Rise and Storm Surge. Coastal Management, 45(4), 277-292. Nawrot, R., Albano, P. G., Chattopadhyay, D., & Zuschin, M. (2017). Climate change and body size shift in Mediterranean bivalve assemblages: unexpected role of biological invasions. Proc. R. Soc. B, 284(1860), 20170357. Ostrander, C. M., Owens, J. D., & Nielsen, S. G. (2017). Constraining the rate of oceanic deoxygenation leading up to a Cretaceous Oceanic Anoxic Event (OAE-2: ~94 Ma). Sci. Adv., 3(8), e1701020. Perry, C., Kench, P., Smithers, S., Riegl, B., Gulliver, P., & Daniells, J. (2017). Terrigenous sediment-dominated reef platform infilling: an unexpected precursor to reef island formation and a test of the reef platform size-island age model in the Pacific. Coral Reefs, 36(3), 1013-1021. Putrasahan, D. A., Kamenkovich, I., Le Henaff, M., & Kirtman, B. P. (2017). Importance of ocean mesoscale variability for air-sea interactions in the Gulf of Mexico. Geophys. Res. Lett., 44(12), 6352-6362. Sanders, L. M., Taffs, K. H., Stokes, D. J., Sanders, C. J., Smoak, J. M., Enrich-Prast, A., et al. (2017). Carbon accumulation in Amazonian floodplain lakes: A significant component of Amazon budgets? Limnol. Oceanogr., 2(1), 29-35. Scarponi, D., Azzarone, M., Kowalewski, M., & Huntley, J. W. (2017). Surges in trematode prevalence linked to centennial-scale flooding events in the Adriatic. Sci Rep, 7(1). Senkbeil, J. C., Saunders, M. E., & Taylor, B. (2017). Changes in Summer Weather Type Frequency in Eastern North America. Annals of the American Association of Geographers, 107(5), 1229-1245. Singh, P., Boote, K. J., Kadiyala, M. D. M., Nedumaran, S., Gupta, S. K., Srinivas, K., et al. (2017). An assessment of yield gains under climate change due to genetic modification of pearl millet. Science of The Total Environment, 601-602, 1226-1237. Stuhr, M., Reymond, C. E., Rieder, V., Hallock, P., Rahnenführer, J., Westphal, H., et al. (2017). Reef calcifiers are adapted to episodic heat stress but vulnerable to sustained warming. PLoS ONE, 12(7), e0179753. Thomas, R. Q., Brooks, E. B., Jersild, A. L., ... Martin, T. A., et al. (2017). Leveraging 35 years of Pinus taeda research in the southeastern US to constrain forest carbon cycle predictions: regional data assimilation using ecosystem experiments. Biogeosciences, 14(14), 3525-3547. Torres, H., & Alsharif, K. (2017). What It Means to Become "More Resilient": An Analysis of Local Resilience-Building Approaches in Three Florida Communities. Wea. Climate Soc., 9(3), 405-419. Wang, E., Martre, P., Zhao, Z., ... Cammarano, D., ... & Asseng, S. (2017). The uncertainty of crop yield projections is reduced by improved temperature response functions. Nplants, 3(8), 17102. Wendelberger, K. S., & Richards, J. H. (2017). Halophytes can salinize soil when competing with glycophytes, intensifying effects of sea level rise in coastal communities. Oecologia, 184(3), 729-737. Wu, X., Fang, H., Zhao, Y., Smoak, J. M., Li, W., Shi, W., et al. (2017). A conceptual model of the controlling factors of soil organic carbon and nitrogen densities in a permafrost-affected region on the eastern Qinghai-Tibetan Plateau. J. Geophys. Res. Biogeosci., 122(7), 1705-1717.